So what's happening at the property? Work to ready the well to provide water, fencing plans, etc. all continue behind the scenes. The owners are getting ready to get a fencing estimate, and to do so, the corners of the property need to be marked to be seen at a distance. Three of us drove out to the property with maps, t-posts, PVC pipe, water, and hats, and headed out to the toward the southeast corner of the property. One of our newer volunteers was part of the group and it was a lovely way to have relaxed chats and get to know each other better! For two of us, it was our first look at the property - and it is beautiful! Juniper and sagebrush, canyons and rock outcroppings, hills and flats. And the quiet! Other than the occasional high jet overhead, it’s so removed from the sounds of everyday life, and traffic, and noise! I could have sat for hours listening to the wind and the rustle of an occasional lizard moving through the sagebrush. As the wind moves in and around the landscape, you can hear it building from a specific direction before it reaches you and the breezes move by. We started at the bottom of a canyon and made our way up and over the top ridge to the general area of the southeast corner. Though we were on the lookout, fortunately no snakes chose to show themselves! Cresting the ridge was breathtaking - you can see for miles from the tops of the hills. Even in our current smoke-haze conditions, the view was incredible. But you can also see how devastating the Winnemucca Ranch Fire has been. The borders are still lined with bright red fire retardant. I feel more strongly than ever that fireworks have no place in Nevada. And my respect for the firefighters that get out in this rough land to protect homes, structures, and the land itself is immense. Only one false start and with persistent pounding, we got the t-post into the ground and the PVC pipe secured. Success! We made our way back down the canyon to our vehicles. I am used to following horse trails on occasion while hiking. I joked while following a deer trail that I forgot how much smaller they are as the trail went under several low hanging junipers that we had to make our way around instead of under. I prefer the horse trails! I found myself still awed at how beautiful the views are. There are several level areas that once held stone picnic tables (now crumbling - hopefully we can replace those with something durable!) for a picnic with views that stretch for miles. It was so easy to stand there and come up with a whole lot of ideas for projects, events, happenings that can be held at the ranch so that finally, people can see, enjoy, (adopt!) 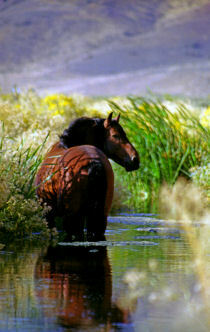 and experience the HVWHPF rescued wild horses in person. The burned areas look bad. I mean, burned land does. Old junipers that are now just blackened fingers reaching up from charred earth. Sagebrush reduced to nothing but a charred mini-stump. Seeing how close the fire line came to distant ranch homes takes your breath away. I can only imagine the terror of seeing the firefighters do everything in their power to save your home. But in the moonscape of blackened acres, there is hope. Small sprigs of green emerging on some of the perimeter burned plants that didn’t get quite as hot. A couple of blades of native grass pushing up through the black clump that was once a full plant. It will come back. Many of the burned juniper are lost forever. But grasses will return, sagebrush will return. Maybe some help of spreading native grass seed specific to that area, we’ll see what can happen. But it will come back in one way or another. There is still lots of acreage that can be fenced and used now. So forward we march. I can’t wait to see what the future brings for the rescued Virginia Range mustangs!